Let us review the results of our first attempt at finding candidate Martian Life Forms (cMaLF). If you attempted the analysis set in the last blog, well done…You should have found the above object of interest, designated, for now, as a possible cMaLF (See Fig 2.1 above). It is likely that all of you will be thinking the same thing. This does not look like any Martian rock I have ever seen but, unfortunately that possibility can never be ruled out. Curiosity did not zap this object with their ChemCam laser. We can never assess what this object is by any other means except Image Analysis. BTW in case you were wondering the black background of this page, dull though it may seem, is deliberate and intended to optimise viewing conditions and avoid distractions (not to increase drama). Images are best viewed in darkened conditions. A 13” screen Laptop was used for this analysis. Mobile phones and massive double screen efforts are not preferred as images are too small or too blurred on those displays. This is an accurate replication of the original observation 4 years ago. After a slow scan of most of the image from top to bottom online at Google Zoom (+)500% to find this object was completely unexpected and unusual after endless Martian rocks that all looked the same. This is not the best image to rely on to examine this object. The linear vertical image defect is a characteristic of MastcamRight images but it obscures very little and is a useful marker in this case. The image is unavoidably blurred because of the necessary ~x9 magnification but also for another reason addressed later. Finally, it does not show all of the adjacent surroundings. The best image will be examined in Part 2 of this analysis, but meanwhile let us work within the constraints of this image…we will often need to do so. What can we see in this image as it stands? A dark grey, boomerang shaped object that is cylindrical at one end with a narrow whitish band close to that end of the object and an orange coloured terminal, a blunt triangular shape with a faint structure that cannot be positively identified. The terminal might extend further – a tiny portion of a cream coloured feature extends right beyond the orange terminator but is hidden behind a rock. Another image may clarify this (and luckily, it does). The cylinder gives way on the left to a shape which is flat on top and has a wedge keel shape on the underside in the central area. Extending left is a taper (~19% ) to the other visible terminal. Possible ill-defined translucent/transparent features extends from the end of the taper to the left aligned with central axis of taper section. Appearance is translucent/ transparent and faint. The tapered portion of the object appears to have a faintly segmented appearance, possibly a spurious effect caused by a translucent/transparent intervening feature between camera and object. Alternatively, this appearance may be an optical or an imaging glitch, transmission artefact, etc, etc, etc.(i.e. technical in origin). The top surface of the object is light grey (possibly shiny), and this may be a lighting effect. Where the vertical image artefact line cuts the object, the object appears to lie in a slight depression in the sand. Possible translucent/transparent protuberance extends from beneath the object to the left. The underside of the tapered section appears to be curved upwards. Overall appearance is unusually smooth. Object appears stiff and rigid over the tapered portion with a complex variable cross section. The analysis of this possible cMaLF is not yet complete. More analysis information is needed to try to eliminate the possibility that this object is a rock or a mineral outcrop. To facilitate analysis requires image enhancement. This technique is referred to on this Blog by the acronym IBCM…(Image Brightness Contrast and Magnification). To analyse this image only the elementary tools of GIMP v2.9 and MS Word will be used. Crop images can be easily captured using Google, pasted into GIMP, sized and cropped, and finally cut and pasted into a Word Document where the observations will be typed in under the analysed image. Arrows, circles and markups of cMaLF is simple, quick and easy to perform in Word 2010. The results observations can be entered into a standard plain text ORF(Observation Report Form) and your observation imagery pasted in at a later date when that has been set up (tentatively on Facebook). Open Word – Click <Page Layout> <Page Colour> select black. Select a grey colour for the text. ORFs accepted by blog members as appropriate (likes) will be archived. Others will be discarded. For those image manipulation specialists among you who wonder why I am not using more advanced software please understand that this is a simple approach deliberately. The intent is for Members to easily find cMaLF using simple to use software, most of which is already on their computers and that they know how to use. Most importantly, if the method and software are the same, the results can be considered comparable. Over-manipulation in different advanced image software that will generate a mass of imagery with widely varying quality and content, that cannot be reasonably compared or duplicated by other members is useless here. Remember please Inclusive = many observers, Exclusive=lone nut! We need consensus for useful observations that will be taken seriously. Use<Prt Sc> to capture a part of the this main image MCR Sol 618 2014 MAY 03 04:16:55 UTC that shows the cMaLF being analysed at maximum Google Zoom (+) 500% (about x9 the original as-posted raw image size) . Many of the more observant and curious among you will wonder what the IBCM version of this image is showing. Yes…Isn’t that interesting? 🙂 That will be addressed in future blogs…Put that to one side for just a little please…we will get there I promise. Continuing the analysis; a small object may be seen in the original crop image (Fig 2.1) as a small white dot aligned with the taper section about 400mm from tapered section terminal. Visibility is improved in the enlarged original image and obvious in the IBCM version. This has the appearance of three small banded cylindrical objects ( see Fig 2.2.c). These objects are not floating in mid-air as may seem to be the case to some observers. These objects are indeed connected with cMaLF but they are nothing to do with the cMaLF under analysis. We need to avoid interesting distractions like this or the analysis will last forever. Moving on. The next technique is tinting. A long time ago our very distant ancestors were arboreal by habit and they had to distinguish between shades of green to spot enemies and find food. Eeek! I feel the monkey coming out in me every time I see these green tinted images! Excuse me…got to go have a banana! Perhaps as a result of this leafy past life, we distant descendents retain the ability to distinguish between more shades of green than any other colour in the spectrum. Generally speaking, blue green tints are better for men (Fig 2.2.d) and dark images and yellow green (Fig 2.2.e) more suited to women and bright images. Applying tints is a way of stacking the odds in our favour, and just for fun I have flung in a Grayscale version of this image (Fig 2.2.f). By using tinting, we sacrifice the colour information of the original image, of course. However an analysis should always include the original image before enhancement or tinting so that is not really so much of an issue. Each of these images provides the Image Analyst with different information about our putative cMaLF. Please look along the tapered section in the Aqua Accent Tint image above (Fig 2.2.d)…the tapered section exhibits a segmented appearance. As can be seen most clearly in the IBCM Crop Image + Olive Green Tint(Fig 2.2.e) there appears to be a line of small indistinct fuzzy features projecting at right angles along each side of the tapered section and the structure of those blurry projections can be better understood in Fig 2.2.g below. At ~x36 the image is brutally blurred, in appearance. This is getting very close to what can be reasonably allowed in an analytical image, the point at which detail does not increase but blurring does with further magnification. As may be seen in (Figs 2.2.a,b,d,e,f.g ) – Extending from the end of the tapered section are a number of cuneate shaped translucent objects of different tints that obscure the background . Appearance is dusky, bushy and also a jelly like with a dull matt surface. They are spread out in a rough fan shape and overlap. These are difficult to see and hard to analyse at first and it helps to mark the outline of what can be seen. The more the image is examined the more will be seen and incorrect and new markups discovered. Mistakes will be made. The Analyst should not worry about it overmuch. These are close to being invisible features and it would be a miracle to get even 50% correct at first. It does take time and patience but most people will become very good at this quite quickly because there are subtle clues that the eye picks up on after a while, that betray the presence of these features. These will be reviewed in detail later on. An unusual, very smooth, ventifact showing three different strata (grey/white/orange) along its length (wind shaped rock) exhibiting atypical features not usually associated with terrestrial rocks or observed elsewhere in Curiosity imagery of Gale Crater to date…Appearance of the object excludes it being a sand formation or terrain feature. Can you think of anything that could explain this object that is not already listed here. Please try your best and do share. Lets see if we can together understand this object better and more completely. A caveat though…please remember that NASA and the scientific establishment in general, have repeatedly stated their opinion on record that the the surface of Mars is a hostile, sterile place on which no life as we know it cannot exist. It is all just rocks and sand. That said, it means that current scientific opinion does not allow us to ever expect to observe anything else at the risk of being shouted down by hordes of indignant scientists frothing at the mouth. A thoroughly unseemly spectacle but possible. And that is exactly why I have opted to ignore current scientific thinking about life on Mars, even though I have adhered, unquestioningly to it most of my life. I now mistrust it and the “thought blinkers” that it represents. The unavoidable facts of extremophiles and terrestrial organisms that have survived prolonged exposure to the condition in space on the ISS has done that. In other words I choose “nullius in verba” (“take nobody’s word for it”). Do you know where that motto comes from? It is excellent advice that has stood the test of time. If you believe after following this blog that the NASA official line is correct then you must of course, hold to and defend those beliefs, as we will hold to ours. If we do have other ideas, we have to explain what it is we are seeing and we will do so as best we can. If we do that well…enough times, eventually the long held beliefs of the scientific establishment will come under a lot of pressure and maybe they will begin to crumble in time and allow new thinking. The question here is not am I or this Blog, correct in our observations…the question for the scientific establishment is “Are you correct in what you have been saying for the last 40 years since the Viking Landers?” Namely, that life on the surface of Mars is not feasible. This Blog will work to analyse the images for signs of cMaLF that the scientific establishment has failed to observe, analyse or publish. Pottering around like gardeners on Mars peering at rocks for signs of past water is all well and good but the direct search for life in imagery is a more immediate approach for addressing the issue and to fail to do so in an organised manner reflects extremely poorly on the scientific establishment. Time to boot those encumbrances into the bin where they rightly belong! The next question is where are the scientific detailed analyses of Mars imagery by NASA that proves the idea that that all that can be seen in Mars imagery are rocks and sand. If the term “self evident” is resorted to that is shaky ground. That is like saying “they are just rocks and sand because they look like just rocks and sand”. Those perceptions will be challenged hard on this Blog. Yes – I have seen analysis of the appearance of rock outcrops that show many noted similarities to terrestrial geological forms. All those publicity handouts that NASA churns out. Yes, NASA have sophisticated chemical analysers spewing out endless data of those tests of rocks and all that data that proves the rock types. It’s data…and data can be compromised, easily, by unanticipated circumstances. I am an Engineering Inspector remember? I have seen it dozens of times…especially in the area of portable XRF analysers and optical spectrographic analysers used for checking metal alloy compositions. My point is about the close up appearance of the rocks on Mars in Mastcam Images particularly. Not MAHLI images for good reasons that will be discussed. Is there one scientist, I wonder, who will stand up and demonstrate here the validity of that suggestion that rocks and sand on Mars are only that, with no signs of anything else?They are welcome to this blog to do that if they wish to. An uncensored platform…No names needed. Let us share thoughts on this freely. Two conditions please…First, plain understandable English…Not a mass of arcane technical terminology or insider speak littered with acronyms that will appear as obfuscation and elitist, when this blog does not look to exclude anyone. Keep it very simple please. Secondly, please present a clear verbal analysis with imagery and justified conclusions based on that analysis and explains everything contained in that image. Analysis should include magnified imagery. This Blog will derive a set of criteria for recognising candidate life forms on other planets using image analysis. This should have been in place 40 years ago at the time of the Viking Landers. Those criteria may exist and may have been published, but I have not, to date found them. My thoughts, for what they are worth, are contained in a .PPT and at the end of the next blog that will be available as a video. We will discuss characteristics of cMaLF that allow us to detect them in imagery. Again a .PPT will give you an easy introduction to this area. A detailed analysis, as far as that is possible, will be tabled on completion of the image observation but it seems reasonable at this point to suggest this object might be considered with a good degree of confidence as a possible cMaLF rather than odd looking rock or a mineral outcrop. If you disagree, please speak up. The assignment for Blog Members this time is to complete the analysis of the right half of the crop image at the beginning of this Blog post using the same techniques as were applied to the left half during this Blog. To do that properly please find another RightMastcam image on sol 618 that shows what is to the right of the rock obscuring the remainder of the terminal of this possible cMaLF and answer the question can we can see in this image the entire cMaLF ? Many visitors to this Blog may feel a little uncomfortable discussing this subject seriously…not nearly as uncomfortable as it was for me to write, rest assured of that. Finding a candidate life form on Mars? Are you nuts?!!! NASA have not managed to do so in 40 years, why do you think you can do it now? A question I have asked myself many,many times over the last 5 years. Honestly, I have no answer to that question except to say that I believe my observations (not my conclusions) can be easily confirmed by others. Mine don’t matter at all…theirs do. They can just as easily confirm what I report or deny it. If the observations agree they will show something else besides rocks and sand on Mars in all imagery of terrain. As I pointed out in the first blog, remember that 25% of scientists at a recent international conference of Mars experts in Netherlands confirmed that they believed there is life on Mars the other 75% believe there was once life on Mars. So 100% of those Mars experts believed Mars had or has life…nobody wants to deny the possibility of Life on Mars. It doesn’t mention how many of those experts were from NASA but since they are the experts it does not take much to deduce that they were present in force and in one or other of the two groups. Take away from that what you will. Finally, perhaps because NASA has, since the Viking Landers , insisted on sterile barren rocks and deserts as the inescapable truth about Mars, the public has not looked at this imagery very closely and thought about what they are seeing. Now we can do so easily and that is directly related to the Internet and personal computers that make the images a click away and software which allows us to manipulate images in seconds that was not thought of as even a remote possibility at the time of the Viking Landers. In normal, as posted raw imagery it is possible to detect cMaLF with practice and excellent eyesight. At high magnification it is hard to miss! This analysis is a case in point. 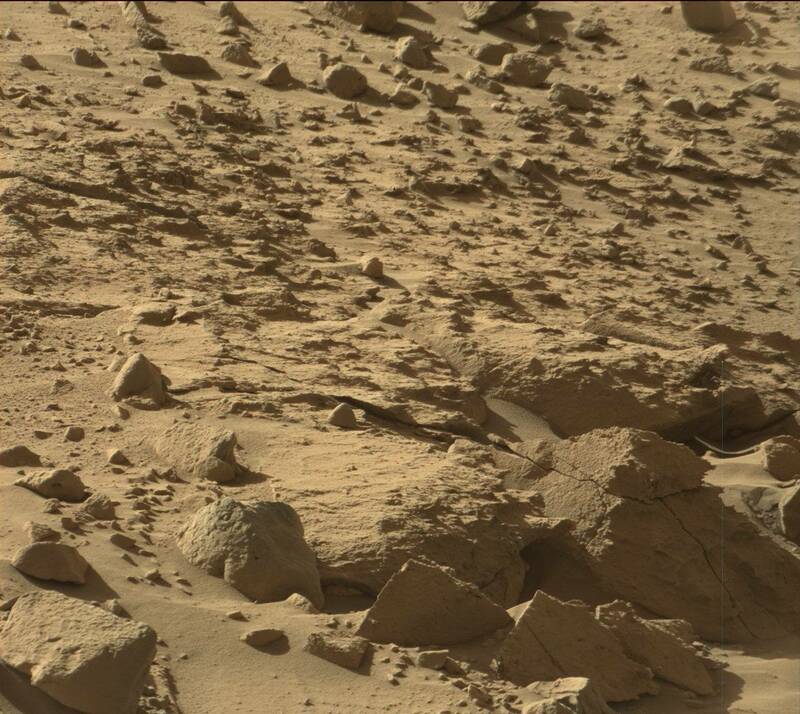 Many will ask “Do you seriously believe that this rock is a candidate Martian Life Form?” to which the answer will be “Do you seriously believe that this cMaLF is a rock?” Please explain your conclusion and show me your analysis…here is ours. Here we observe and deduce and speculate (if you will) but do not ever claim…because it is impossible without much more scientific investigation to do so. That is NASA‘s job and that of other space agencies. An unenviable task I may add! P.S. – There will be some Members perhaps, who will point to the “columnar image artefacts” exposed in the adjusted crop image ( Fig 2.3a & 2.3.b) indicated by the white arrows ( red arrow indicates a well known image artefact in MastCam Right images) and suggest that the IBCM image adjustment was too extreme thus rendering the images invalid for analysis. However careful examination shows that these “columnar image artefacts“ have variable length and width and shape, and many can be detected in the original crop image before IBCM adjustment at lower magnifications. As will be shown later, multiple clues reveal their true nature . They are common cMaLF related features seen repeatedly in most images of Mars terrain as multiple analyses on this blog will demonstrate. As a further quick check of the accuracy of this suggestion that these image objects are merely image artefacts, a nearby area of sand is shown below(Figs 2.3.c & 2.3.d) at higher magnification. If these were Columnar Image Artefacts they would probably be apparent in this image. This part of the image is much brighter and so it has been adjusted to similar image quality by adjusting Image Brightness to -8% and keeping the same Contrast Setting. In the next version Image Contrast is increased to 70% and Image Brightness to 0%. No similar “Columnar Image Artefacts” are observed which suggests they are real image objects and not image artefacts. BTW does anyone believe that these images look like sand on Earth? Look carefully and you will see a complex cMaLF emerging from a hole in the sand in the foreground. There are hundreds similar cMaLF in this small field of view. It is impossible to see the sand directly. It is blurred away by this dense carpet of cMaLF.